Love the yeasty flavor of a piece of freshly baked french bread? Love pancakes? Well, this Moroccan beghrir recipe is for you. 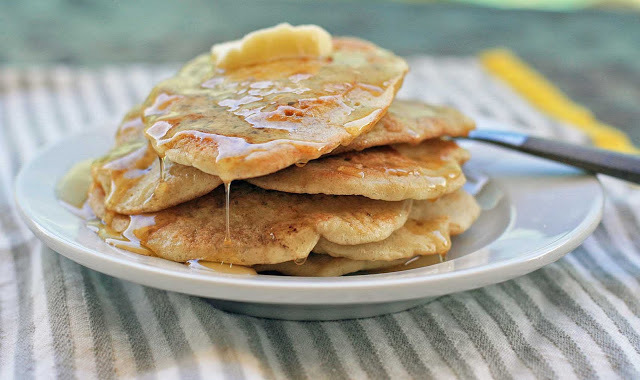 I’d never heard of using yeast in pancakes before (baking powder is much much more common as a rise agent in the United States), but this recipe was a winner. Golden pancakes are dotted with hundreds of bubbles on the surface and have the unmistakable flavor of fresh-out-of-the-oven bread. The batter comes together quickly, but it does require some planning ahead since it needs several hours of resting time. So while it’s not for your average, rushed weekday morning, it might just be the perfect thing for your next weekend brunch. Combine the rice flour, sorghum flour, potato starch, yeast and salt in a large bowl and mix to combine. 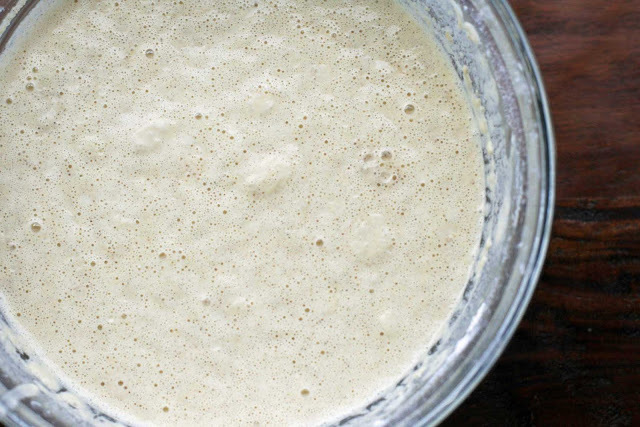 Heat the milk and the water in a saucepan or in the microwave until warm to help activate the yeast. While whisking, slowly pour into the flour mixture and mix until well combined and there are no lumps. Add the eggs and mix until thoroughly blended. Cover with a cloth and let rest is a warm place for two hours. To cook the pancakes place a heavy frying pan that has been lightly coated with butter or oil over medium heat. Pour small ladles of batter into the pan. Cook for several minutes, until the bubbles have formed on the surface of the pancakes and the bottoms have begun to turn golden. Flip and cook on the other side until golden. Repeat with the remaining batter, adding butter or oil to the pan when necessary. Top with a pat of butter and a heavy drizzle of honey. Note: If you’d like a thicker pancake, just reduce the water to 1/2 cup.